Setting up an effective SEO campaign in a competitive market can be a long drawn out and expensive process. Worse yet, if you are focused on the wrong keywords, you might need to start over again after you find out that your site is not producing the results you want. An easy way to avoid needing to start over is to test the value of keywords before you heavily commit to your SEO strategy. Buying pay-per-click ads (PPC) from search engines like Google (AdWords) and Microsoft (adCenter) allow you to see what keywords have the ability to drive traffic to your site. Here are some free coupons to help get you started using paid search to test your SEO strategy. If you do not yet have advertising accounts with the major search engines, please create your Bing Ads & Google AdWords accounts real quick & then come back to this page when you are done. When I was fairly new to the search game a client of mine told me that he wanted to rank for a list of fairly broad keywords. We were slowly moving up the search rankings, but he was not seeing much return on his spend. SEO is an investment game and it takes time and capital to build momentum. He had a rather low budget though, so it was taking months to see little response. I could tell that things were not working out as well as either of us planned, and suggested we shift his budget over to AdWords to see what keywords are most valuable for his business. It turns out that the keywords he told me he wanted to rank for had very little value to his business. If I bid more than 15 cents a click for any of them we lost money. But there was a line of products he sold that had some related keywords which people converted on at a great rate. 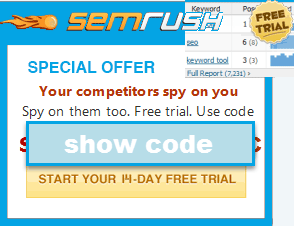 We could afford to pay $2 a click for some of these keywords and still make profit. In late 2004 we adjusted his SEO strategy to match what worked well on the pay per click ads. His small niche business grew so quickly that he had to hire on help. When the economic downturn happened in 2008 and 2009 many competing businesses went out of business. Had we not used AdWords to test his keyword strategy his business would have likely went under as well. But he still ranks at the top of the search results, and he ranks for the right keywords, because his SEO strategy was focused on what keywords worked well for his website. Search is a winner takes most market. In search almost all the clicks go to the sites on the first page of the search results. 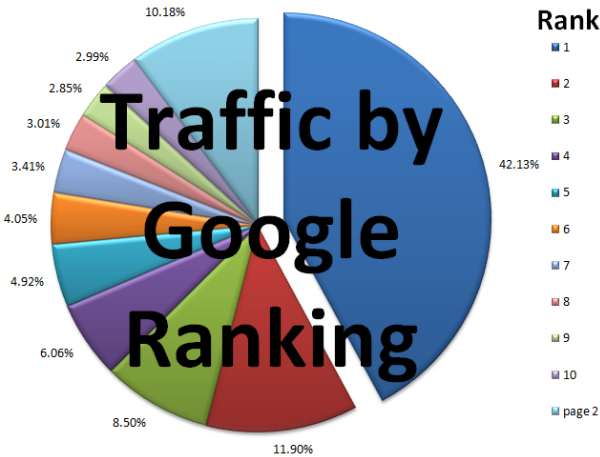 Within that first page of search results, most of the clicks go to the top 3 ranked websites. This image shows a rough breakdown of traffic distribution by ranking position based on search data Aol leaked a few years back. If you rank #12 or #15 for a big money keyword (like credit cards) you would be lucky to make $20 a day from that. But if you ranked #1 or #2 for a less competitive keyword (like credit card comparison) you would see far greater returns. If your ambition vastly exceeds your budget then odds are you will either give up or go bankrupt before you become profitable. If your website is brand new & has few inbound links it will be cheaper and easier to rank for longtail keywords than the core keywords. Use the income from that early longtail success to build your site's authority & over time you will rank for more competitive keywords. If you want someone to do a $20,000 SEO job for $500 then most likely you will end up hiring someone who is either new & inexperienced, or someone who intentionally delivers poor results. If you are uncertain what you should be doing, get educated. Install analytics on your website today. Run a test campaign on Google AdWords to see what keywords convert well for your website & use this data to help build your SEO strategy. If you are not sure what words to bid on you can run broad or phrase match ads and taste the market. This 7 day series intends to be a solid primer, but if you still have questions our training materials are online 24 hours a day & our community forums are open 24 hours a day. If your customer's website is brand new you may want to include a Google AdWords test budget in your SEO package for new clients. This helps you collect valuable feedback to build your SEO strategy upon. It also ensures you are delivering value to the client almost immediately, which ultimately builds trust. That will help you in your ability to increase the client's budget and accelerate the growth of their business. The paid traffic also has a further benefit of helping the client see / understand / appreciate the value of the traffic you are bringing. As their organic search rankings increase (in the coming months) you are selling them high quality search traffic for less than what it would cost them to buy from Google. This means you are positioned as a cost savings rather than a cost source. Using paid search in conjunction with SEO also helps you smooth out their growth curve. If they are growing quicker than desired you can temporarily pause the AdWords campaign and/or reduce the ad budget. If SEO traffic takes a dip (and/or they would like to grow faster) you can ramp up their AdWords campaign. If your experience tells you that the client's budget is way too small for their desired goals then set expectations right away. If a prospective client or a new client is inflexible then you may want to skip the project. Setting expectations allows you to focus on achievable goals that will produce results, rather than negotiating an ever-changing set of goals after the fact. If you and the client are both somewhat uncertain about the market then ask to set up a test budget to run an AdWords campain. If those results look good then you can plan building an SEO proposal based on that market feedback. Not every keyword you try will be profitable. But if you try a variety of keywords tightly related to your business you are far more likely to succeed than if you only bid on 1 keyword. Most businesses should test at least 5 to 10 different keywords, while retail oriented businesses should test a much larger set of keywords, driving traffic to the most relevant page whenever possible. 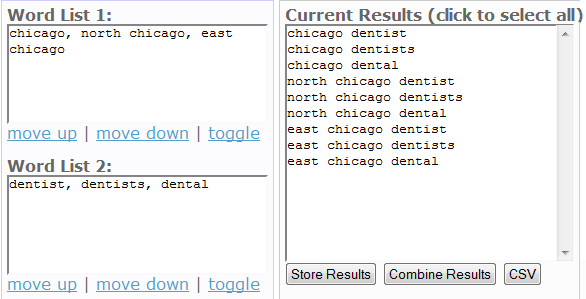 Some tools, like our keyword list generator, make it quite easy to quickly create a list of related keywords by entering locations in one box and core keywords in the next. An alternative to using such a keyword list generation tool is to use modified broad match targeting & then use negative keywords to exclude the areas where the targeting is too broad. Negative match looks like -this & tells search engines not to target that keyword. Search ad targeting is based on more precise targeting, whereas the content / display ad network is more based on broader keyword themes. All the major PPC ad networks have built in conversion tracking tools which show you what keywords and ad groups convert well. You can also pass the conversion value through to these tools to know exactly how much business came from each ad campaign and each keyword. Here is some real data from one of our AdWords accounts. If tracking conversions is hard, you can place a link to a coupon (or some other free offer) on your landing page and view a click on that coupon page as a proxy for conversion and user intent. Some more sophisticated strategies involve setting up different 1(800) phone numbers based on the marketing channel or keyword. There are a lot of smaller ad networks that sell traffic as well, and they have the allure of "cheap" traffic, but it is often cheap for a reason: typically there is no value to be had there! Most of them have low traffic quality, so (even if the clicks are cheaper) they don't help you save money (because they have worse conversion rates), and they do not offer representative market feedback. Further, their limited marketshare means that it would take a long time to get any useful feedback. For most advertisers the smaller search ad networks are a complete waste of time. If you want more great advice on pay per click marketing, we run a sister site called PPC Blog with AdWords expert Geordie Carswell. He offers a free starter guide to paid search here. Over the past few years Google has significantly changed their search interface to push users down certain pre-determined paths (through things like search auto-completion). They have also held back keyword-level data from SEOs by using secured search (that blocks sending the keyword-level data). This keyword-level data *is* sent to advertisers who buy AdWords ads. For these reasons, now more than ever it makes sense to build your organic search campaign from data gained through PPC testing. Find out which keywords have value for your business, and set up your site structure based on the top performing keywords. Tomorrow we discuss "on-page optimization" — how to use your keywords on your webpages. PS: Here is an infographic which looks at some of the ways Google has consolidated search volume & made it harder to get SEO performance data for those who are not buying AdWords ads. "I wanted to learn, so I could see what they were doing, having spent over a grand!! I can now see they have really done very little. In a couple weeks with your training program I'm actually starting to see results, and I've not even started the link building side. It makes me wonder what on Earth my SEO company have been doing for the last 6months!!! I'm going to go it alone and just use the seobook. "Aaron Wall’s SEO Book is the best guide I have found for getting serious web visibility."